SSH to ESXi host and browse the volume where the VM resides on. cd into the VM folder and found flat files for each of the vmdk disks but the VM does not show that any snapshots exists. Found the following KB 2013520 which outlines the same problems but just for committing a snapshot that already exists. The issue seems to exist due to corrupted CTK files. These files are associated with each delta disk and flat file for the virtual machine. After doing some further investigation I found that the there was a very large snapshots on this VM (> 150Gb) and after committing the snapshot it seems to have corrupted the CTK files. The CTK files describe the VMDK characteristics/attributes of which the actual ‘data’ is stored in the in the *-flat.vmdk file. Like in our case if you have multiple disks attached to a VM, then you’ll have multiple descriptor files that link to their actual disks. You can actually view the contents of the file which provides information such as chain IDs, the type of VMDK, it’s data disk, hw version, etc. Just this week ran into this issue while trying to unmount some stale datastore from vCenter server. SSH into the ESXi host and browse the datastore. Found KB 2069171 specifying this problem where the VSAN modules stores the traces needed to debug VSAN related problems which is keeping a lock on the datastore. Since we are not using VSAN I had to disabled the VSAN services on the ESXi host to remove the datastore. Initially the unmount of the datastore still did not exceed and this was due to my SSH sessions which has the datastore open 🙂 Close the SSH session before trying to unmount. Scratch for host is configured on the problem datastore. Modify the ScratchConfig value and change it to another datastore. For more information, see Creating a persistent scratch location for ESXi 4.x and 5.x (1033696). Coredump is configured to write to a file in the problem datastore in an ESXi 5.5 host. For more information see, Move the coredump to a File from the VMware vSphere 5.5 documentation Center. Verify the UUID and compare to datastore name. Run following command to remove the coredump files. vCloud Director: Error on provider VDC "No datastores accessible to VDC "
This normally happens when a new datastore is added to the storage cluster which is associate to a storage policy for the vCloud Director Organization. The rule-set (storage capability) was not properly set to the datastore before it was added to the datastore cluster. This storage policy is not backed by any usable datastores accessible from this VDC. There is no usable datastore accessible from this VDC that supports this storage policy. Ensure that this storage policy is backed by at least one datastore in vCenter Server, this datastore is enabled in vCloud Director, and the datastore(s) are accessible by the hosts in the clusters used by this VDC. Verified that all the datastores in the datastore cluster have the storage capability (Tag) assigned which is associated to the provider VDC. On Home page, select Vm Storage Policies. Refresh storage policies for vCenter on vCloud Director System. In vCloud Director, under vSphere Resources select vCenters. vSphere web client 5.5: Add new datastore to storage cluster with associate storage profile. Adding a new datastore to vCloud storage profile has change just a little bit with vSphere Web client. This is normally handled by storage team which will provide the LUN. Since I am also the storage engineer I created the LUN from my Dynamic Pool on the Hitachi AMS 2100. Only need to check the Scan for new Storage devices. Type – VFMS or NFS depending on block or file level storage. Go to vSphere web client home page. Select VM storage policies which will be associated to this datastore. Add the Tag to datastore for association to VM Storage policy. Now you can add the new datastore to the Datastore cluster. The main thing to take note of here is that Storage capabilities created in vSphere client is migrated over to TAGS within vSphere Web client. 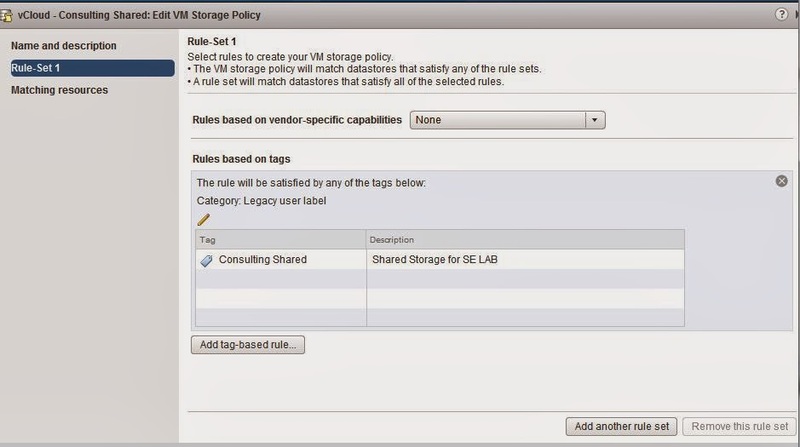 These tags are then assigned to the VM Storage Policy through the rule-set.